Size: STD is currently out of stock! Have you ever wondered what it's like to become your favorite video game character? You can now with Five Nights at Freddy's Teen Nightmare Chica Costume. Our scary Nightmare Chica Halloween Costume is sure to creep your friends out. Dress up as the terrifying Five Nights at Freddy's animatronic chicken and say "Let's Eat!" as you scare your friends and family. 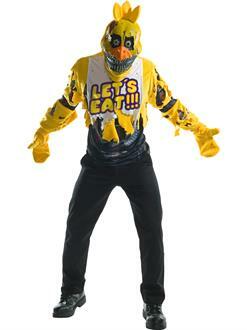 The Chica Halloween disguise comes with a costume shirt, mitts, and mask. Buy a Teen Five Nights at Freddy's Nightmare Chica Costume today!